We offer this trip all year long. Arrive in Paramaribo. We will pick you up at the airport, and then transfer you to your selected hotel. Formerly a statuesque townhouse, the Eco Resort Inn has been lovingly renovated while maintaining the authenticity of its exquisite colonial architecture. It has been transformed into the most charming lobby of one of Paramaribo’s most favoured hotels with numerous eco-friendly features. We depart from Paramaribo heading south, passing impressive giant trees and villages, to start our day with a nature and culture experience. After 118 miles (190 kilometers) we arrive at Atjoni the mooring place of the dug out boats, where we start our exciting canoe trip. This trip by motorized canoe will take about 55 minutes to reach our destination, the comfortable Anaula Nature Resort, which is situated at the foot of the Ferulassi rapids. During this trip you can enjoy the breathtaking nature, the turbulent Jaw-Jaw rapid, and we will pass several Maroon villages. When we reach Anaula Resort you will be carried away by its peace. This will be your home away from home during your stay. After a light lunch in buffet style in our beautiful restaurant, you can check in. After this you have the opportunity to discover the island. In the afternoon we will go by boat to the Ferulassi rapids, where you can relax, swim or enjoy a natural whirlpool. After dinner our guide will explain a little about the Saramaccan culture. After this we will go for an exciting adventure, spotting caimans. 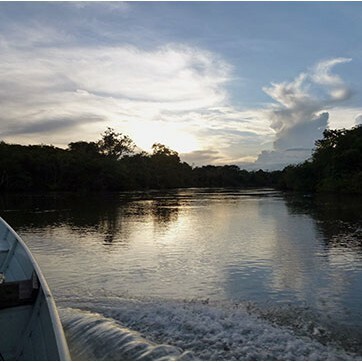 During this night trip by boat, you can enjoy the breathtaking starry sky and the total silence of the Amazon Rainforest. After breakfast we'll head to New Aurora by motorized dugout boats for a village walk. During the tour of the village you will discover the local population and their unique way of life and their traditional customs. We will visit the mission with a church, a school and a medical post. Around 16.30 p.m. we go for a bush walk around the island where the resort is located. During this walk we will get information about the local medicinal use of plants. During the civil war in 1986 the Jungle Commandos with their leader, Ronnie Brunswijk, visited the island for their "immortality rituals". The remains of these rituals remind us of the island’s unique piece of history. After a delicious dinner enjoy a cultural dance performance. Traditional dances like the Seketi, Awasa and Bandamba will be presented. Our guide will explain the content and meaning of these dances. Note: the cultural dance event is being offered at a minimum of 8 (eight) guests. You can also choose to participate in excursions such as visits to the plots of the local residents. 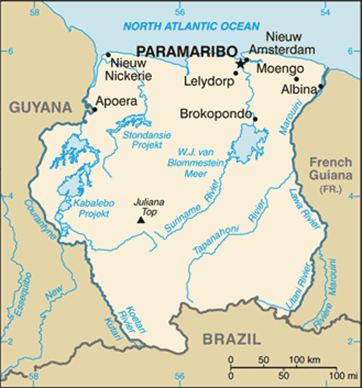 After lunch we return to Atjoni, from where we depart by bus to Paramaribo. Transfer to the airport for flight to Ogle International Airport in Guyana and transfer to your hotel. 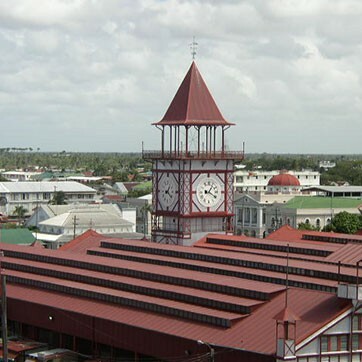 Georgetown, the chief port, capital and largest city of Guyana, is situated on the right bank of the Demerara River Estuary. It was chosen as a site for a fort to guard the early Dutch settlements of the Demerara River. The city of Georgetown was designed largely by the Dutch and is laid out in a rectangular pattern with wide tree lined avenues and irrigation canals that crisscross the city. Most of the buildings in the city are wooden with unique architecture dating back to the 18th and 19th centuries. For the most part the buildings have Demerara shutters and designed fretwork, which trim eaves and windows. Main Street, Georgetown, provides several excellent examples of old colonial homes, a prime example of which is the State House, built in 1852. The State House is set in large gardens and is painted green and white and has hosted many visiting dignitaries. During your visit to Georgetown there are a number of interesting sights that should not be missed, the most famous being St. George’s Cathedral. The Cathedral is one of the world’s tallest free standing wooden buildings and was consecrated on 1892. The foundation stone was laid on November 23, 1890, and the building was designed by Sir Arthur Bloomfield. The story of the cathedral is told in the interior on tablets and memorials of an historical and sentimental nature: it is the tale of the history of Guyana in general and of the Diocese in particular. splendid example of Gothic architecture, and further along are the Victoria Law Courts and St. Andrew's Kirk. St. Andrew’s is the oldest surviving structure of any church in Guyana. conceivable item from household goods and gold jewellery to fresh meat and vegetables brought to town on the river daily. The clock tower can be seen for miles around and is a famous landmark. No trip to Georgetown would be complete without a visit to the Botanical Gardens and zoo. The Botanical Gardens houses one of the most extensive collections of tropical flora in the Caribbean and are laid out with ponds, canals, kissing bridges and a bandstand. Over 100 species of Guyanese wildlife can be observed at the Zoo, including a wide variety of tropical fishes and birds. The tour will include walking along the Avenues with an experienced guide who will give you the history, rumour and facts on Georgetown and its citizens. The group will be accompanied at all times by a vehicle, which will be used for travel between areas of interest. Along the way visitors will sample local exotic fruits, snacks and refreshments. During the tour there is always the opportunity to purchase that unusual gift or unique Guyanese handicraft, or for the daring the chance to delve into the gold and diamond market. You will leave early from Lethem for a 6 hour adventurous drive through an historic mining town and the rainforest to Iwokrama where you can get settled into your room. Afterwards, you will depart for Turtle Mountain. A trip to Iwokrama is not complete without a hike to the summit of Turtle Mountain for a stunning view of the jungle vista. After breakfast, the journey starts with a peaceful and scenic half hour boat ride where you arrive at the base of the mountain. The trek to the 950 foot (290 meter) Turtle Mountain summit is mildly challenging and takes about 1 ½ – 2 hours, but the breathtaking views are more than worth the effort. Turtle Mountain provides a gorgeous view of the top of the rainforest canopy. Along the way you may see a Harpy Eagle or the Greater Yellow-headed Vulture, King Vulture, Gray-headed, Double-toothed, and Plumbeous Kites and Black-faced Hawk. The trails may reveal Little Chachalaca, Marail Guan, Black Currassow, Squirrel and Black-bellied Cuckoos, Blue-crowned Mot Mot, Collared Puffbird, Pygmy, Antwrens and many more! You may also be rewarded with sightings of monkeys such as red howlers, wedge-capped capuchins and black spiders. After your return, enjoy another refreshing local lunch and an ice cold beverage. As you return to the River Lodge, you may catch a glimpse of the elusive jaguar; South America’s largest cat. Spend a relaxing evening enjoying dinner overlooking the scenic vistas of the Essequibo River. After a relaxing dinner, join us for a cruise on the Essequibo River through the black of night, lit only by a pale moon. Your guide shines the spotlight and there it is… the red-eye glare of the black caiman! Frequently and closely seen lying on the river banks, the worlds’ largest of the alligator family grows to 20 feet (6 meters) long. A boat ride at night may also introduce you to other nocturnal creatures such as tree boas, pacas, nightjars, and hula tree frogs. Depart at dawn to the Canopy walkway.The 505 foot (154 meter) state-of-the-art Iwokrama Canopy Walkway offers a totally unique experience in the region and envelopes you in the jungle’s mid-level canopy through a series of suspension bridges and decks from heights of up to 98 feet (30 meters). Heritage list of historical monuments since 2002. 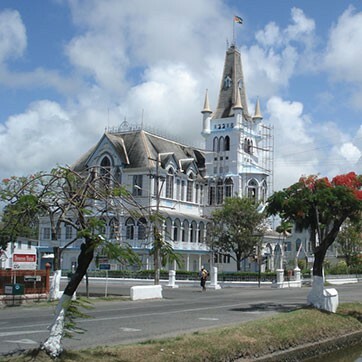 Here, you will be to take a guided tour, by car and on foot, along the most prominent historic locations in downtown Paramaribo during which you will be impressed by the unique architecture. The guide will give you extensive information about the former Fort Zeelandia, the Presidential Palace, Independence Square and many other monuments. The monumental buildings are a true representation of the colonial history of Suriname. After a stroll passed the Waterkant, along the bank of the Suriname River and through the Palms Garden, you will also enjoy other interesting sites such as a mosque right next to a synagogue. We will pick you up at the hotel, and then transfer you to the airport.